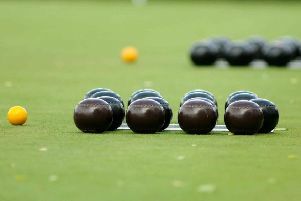 The contest for the runners-up spot in the Morning Triples league at Louth Indoor Bowls Club went right down to the wire. A win-or-bust situation saw the two teams in contention go head to head against each other. It had been set up nicely by Matelots beating Puffins 18-9 and staying one point ahead of Dreamers who won 15-11 against Otters to ruin their opponents’ chances of pinching third spot. After a steady start to the vital match in the final round of games, it was Matelots’ trio of Jean Dracass, Trevor Craven and George Snowball who eventually triumphed 16-6 against the Dreamers team of Barbara Shufflebotham, Roger Orme and Pat Wolley. League champions Kestrels rounded off their fixtures with a 12-8 win against Wishfuls in a close game. * The final of the Australian Pairs proved an interesting contest and worthy of ending the season. It looked as though Malcolm Pearce and Rachael Stanley would ease to a comfortable victory as they held leads of 9-1 and 12-3, but opponents Tony Powell and Liz Draper fought back to level the scores at 12-12. Pearce and Stanley then went one shot ahead, but on the very last end it was Powell and Draper who were looking good for the trophy when holding three shots. But Pearce then produced a superb draw with the very last shot of the match to pinch the victory. * The open weekends at the club, helped by promotional work on Louth market, advertising in local magazines and a leaflet drop around the area have proved successful in recruiting a number of new members. * This week has also seen the start of the Winter League season with a full programme of fixtures.